I have big feet. Finding appropriate climbing footwear is a challenge. Last spring, after a trip to the Ruth Gorge and a trip to Rainier my feet were a mess. During our descent off the summit of Rainier I was taking double doses of ibuprofen and acetaminophen simultaneously. When I removed my boots in camp the tip of my right sock was bloody, my big toenail was detached from the nail bed and the whole area was pretty tender. Yuck. In June, after returning from Rainier, I decided it was time to pull the trigger and buy some new boots. I ordered a pair of La Sportiva Baruntse and the La Sportiva Nepal Extreme, both in size 49. Most bootmakers don't make mountain boots that big. In fact, to my knowledge the only boots made above size 14 are the Nepal's, Baruntse's and the Lowa Civetta. Rock and Snow ordered the boots in June. I had the Baruntse boots in a month (they must have been in the U.S already. The Nepal's didn't arrive from Europe until September. As it's been a warm and relatively dry winter, I haven't put too many days on either boot yet. 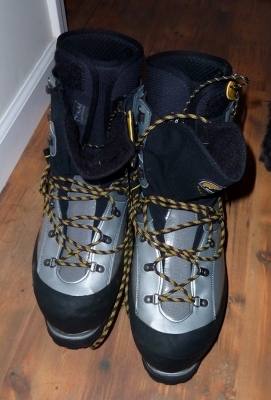 However, I can comfortably say the Baruntse works better for frontpointing on steep ice than any boot I've ever worn. You can effortlessly stand all day on the frontpoints, and the additional sole rigidity makes climbing steep ice in my less aggressive Sabretooth crampons feel easy. I can't wait to use them more thoroughly during my upcoming trip to Newfoundland in February. They're warm too. I wore them for one day of guiding when the high temperature for the day was 1 degree Fahrenheit. If you have chronically cold feet, as I do, check out the Baruntse.There's also a great review of the boot over at Cold Thistle.